LineShapeKin includes a Python-based extension to popular spectral-processing package Sparky. 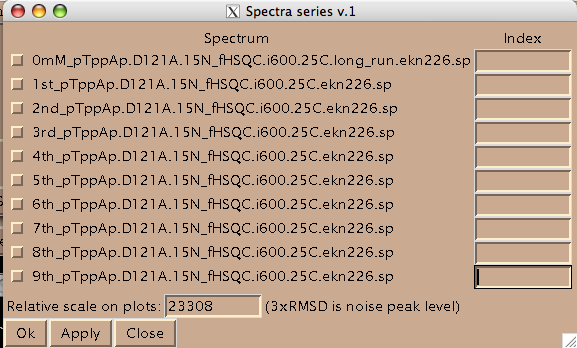 LineShapeKin is also compatible with NMRView with spectral-extraction functionality being part of NMRView program itself. Other spectral analysis software may be made easily compatible with LineShapeKin due to plain text format used by Sparky extension for output of spectral data for Matlab. In a sense, LineShapeKin Matlab M-files do not know where 1D slices originate from. First, you open the project containing the HSQC series. All the peaks you want to work with should be labeled. 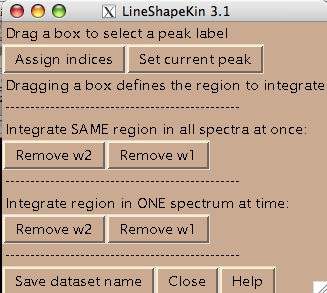 LineShapeKin uses the peak label to generate name for the folder to save 1D line shapes to. You should not have any extra spectra in this project because LineShapeKin goes through ALL open spectra to collect spectral data. 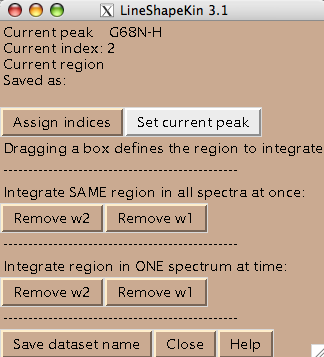 Add integers starting from 1 and click on check-boxes next to the spectra. 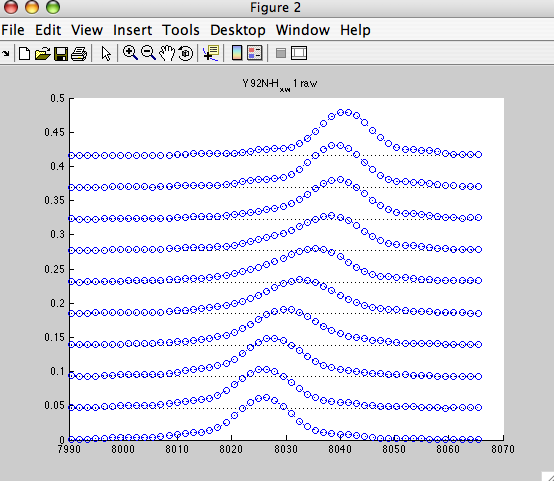 These are the numbers your titration points will be known to MATLAB as. Now you should hit [Apply] and then [Close] to close this window. Hit [Close] in previous window as well and now you are left with just window from LineShapeKin. You are ready to begin extraction of NMR line shapes. First you should select a peak the line shape 1D slices will belong to. 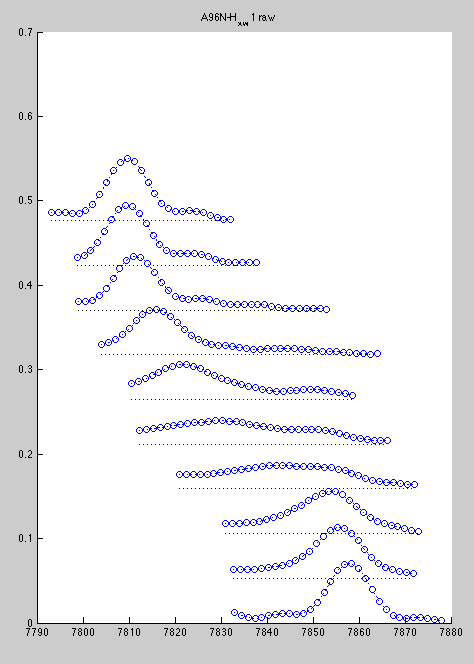 Drag a rectangle around the peak label and hit [Set current peak]. The captured peak name is shown in the window. LineShapeKin will use this name for all 1D slices from now on until you hit [Set current peak] again. Usually you should define a narrow rectangle going through the peak maxima along the desired dimension so all 1D traces you collect contain significant signal. Once you hit [Remove ...] button LineShapeKin makes a subfolder Data_for_MatLab/Y92N-H_x_w1/ and displays data folder name in Saved as: field. 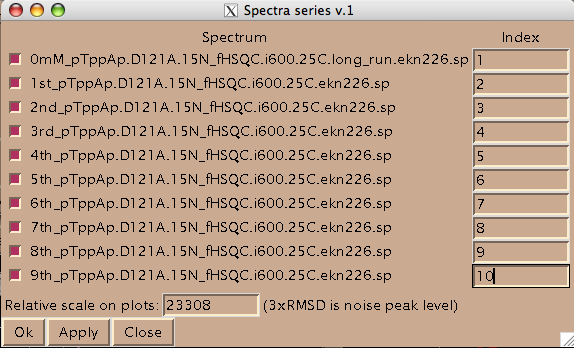 index.txt files with raw integrated spectral data from each spectrum in a plain text form as an X-Y array. This data may be edited. 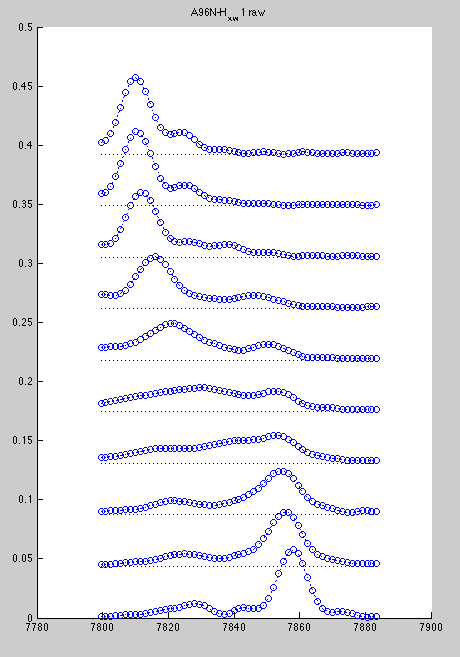 If you prefer, you may produce this kind of data with any other program than Sparky and then read them by LineShapeKin module in MATLAB. The points_list.txt file that contains a list of indices. This file directs MATLAB LineShapeKin M-notebook to read specific index.txt files so you may exclude any bad titration point from further processing by simply removing corresponding index from this file. The files manual_R2.txt and manual_w0.txt are produced empty. 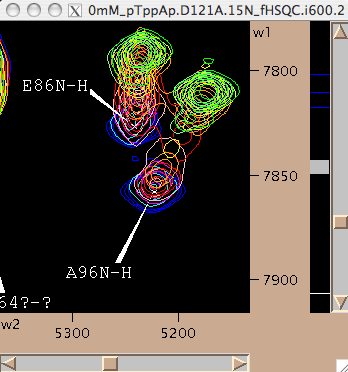 This is a signal to MATLAB later to initiate automatic estimation of positions and line widths of free and bound state of your molecule. You may override automatic estimates by providing corresponding relaxation rates (/s) or free-, bound- frequencies (Hz) or both. 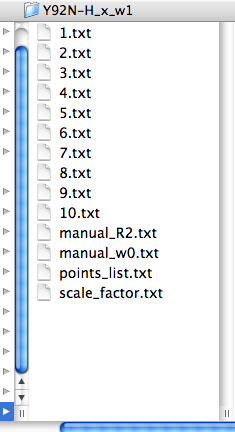 The file scale_factor.txt contains a numerical factor to scale experimental intensities with for fitting. This factor is applied to all 1D slices so has no influence on the outcome of model fitting. 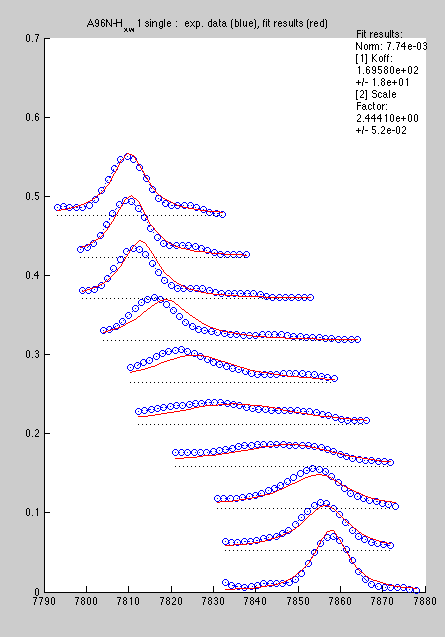 However, different peaks will be sliced differently and yield different total intensities due to integration procedure. To make it possible to do global fitting of multiple residues we need to establish Scale Factors, specific for each peak slicing operation thus making peak intensities for different resonances normalized to unity. The file is written with '1' but later fitting session in MATLAB allows establishing the correct number to put in here. It is important to remember that the Scale Factor compensates for the specific rectangle you took in Sparky, therefore every new slicing operation will reset the number in the file back to '1' so you have to adjust it again after the first fitting run. Hit [Set dataset name] to add data set name to the Data_for_MatLab/matlab.peaklist. This is a plain text file generated for your convenience so you could cut-and-paste dataset names from it into the setup.m Matlab notebook. NOTE: the X-axis is following normal direction here. For better comparison with Sparky display you may switch Sparky to Hz units (vt). 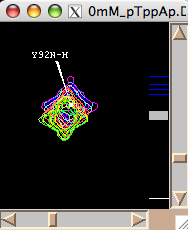 In such a case you can slice one spectrum at a time, because at every titration point two resonances are resolved. To do extraction of the line shapes from individual spectra you have to execute 'all spectra at once' option first, because it creates necessary file structure for all spectra. 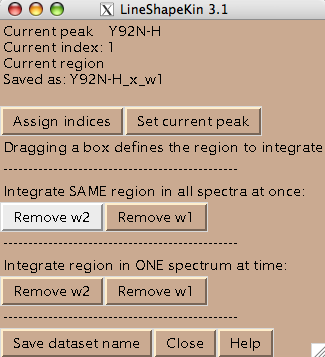 After that, you can draw a rectangle in every individual spectrum and hit [Remove w2] button under the option 'Integrate region in ONE spectrum at a time'. When you do it LineShapeKin replaces the existing 1D slice created from common rectangle ('all spectra at once' option) with the slice using specific current rectangle. 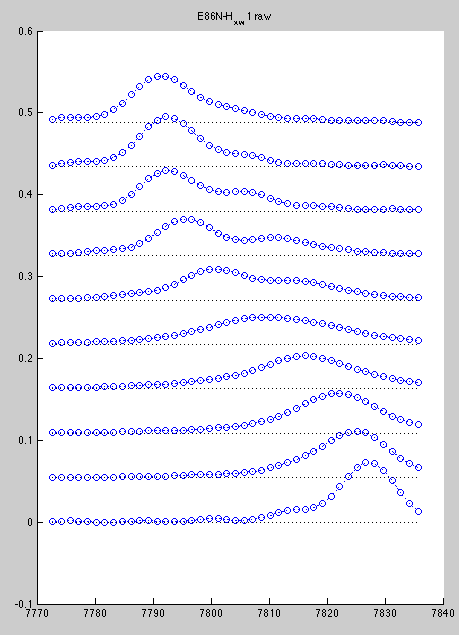 The LineShapeKin window will show the index value corresponding to the 2D plane you took data from. Certainly, with a large number of peaks to analyze the first procedure is more productive, so I would reserve the second for special cases. For successfull fitting of your data make sure to include the tails of the lorentzian line . If you don't include tails down to the baseline than you are not including full area of the line in calculations and it distorts the results. If you have any case of slow exchange (when peak is not moving) - use extraction procedure with the same region ( 'all spectra at once'). The reason is that if your line shape splits into two peaks - you must entirely encompass them with the rectangle, otherwise their relative intensity will be altered and that will certainly distort the fitting results. Therefore, use procedure of individual peak slicing ('Integrate region in ONE spectrum at a time') with caution. In case of very large chemical shift changes in fast exchange - certainly use individual slicing option, because otherwise common rectangle will include too much of empty baseline and signal/noise ratio will be degraded (not mentioning increasing demand for RAM leading to 'Out of Memory' error in Matlab).